And it was an awesome event. Was it on a weekday? Yes, it was. This past Thursday, January the 26th we celebrated the freedom to smoke cigars with Nick and Janine Perdomo. Our first 2012 event ever started at 6 pm when Nick Perdomo, Perdomo Cigar Company owner and Billy Perdomo, Perdomo Cigar Company Regional Sales Representative for the State of Florida, arrived to Cuenca Cigars in Downtown Hollywood. The Cigar Showcase was at the entrance to the store, providing a display of the Perdomo Cigars line of cigars. 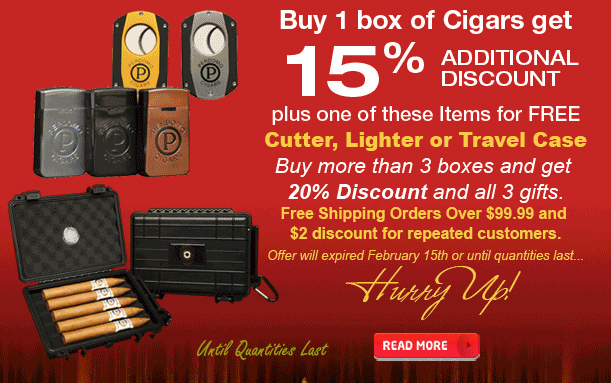 The event specials were fantastic, for every cigar box purchase customers were able to pick between a Perdomo Table Top Lighter, Perdomo Cutter or a Perdomo Travel Case. The Perdomo Table Top Lighter was the most popular item of the night. Raffle prizes at the end of the night included the following items: Perdomo Cigar Lighters, Perdomo T-Shirts, Perdomo Travel Case, Perdomo Lighter, Lotus Lighters, a courtesy of Lotus Lighter Company of which the owner visited our store that day, Cigar Box Wine, a courtesy of Cuenca Cigars. Event Specials scheduled to be available until the end of the month or until quantities last. Whichever happens first. Our dear friends, John Gillan and Donn Werrbach were in charge of preserving the event memory throughout the Pictures and Videos. Here we have a John Gillan’s Cuencarian point of view. This was a night forever to remember. Cuenca Cigars store was full of fun, freedom and great atmosphere. Many new faces were seen that night, people from all over Florida have traveled to visit meet Nick Perdomo and they were really happy. Thanks to Nick and Janine Perdomo for coming and staying with us until the end of the night, thanks to John Gillan for this beautiful memories, Thanks to Donn Werrbach, for our Perdomo Event soon to be released movie and to all the Cuencarians and soon to be for coming to Cuenca Cigars and makes of this event a memorable one. Thanks to John Gillan for the awesome pictures and to Donn Werrbach for the Video.